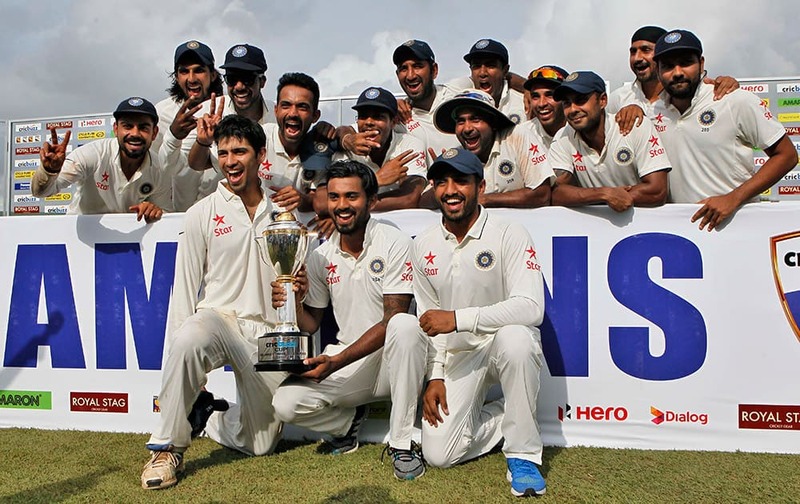 Indian cricketers pose with the trophy after they won the test cricket series against Sri Lanka in Colombo, Sri Lanka. 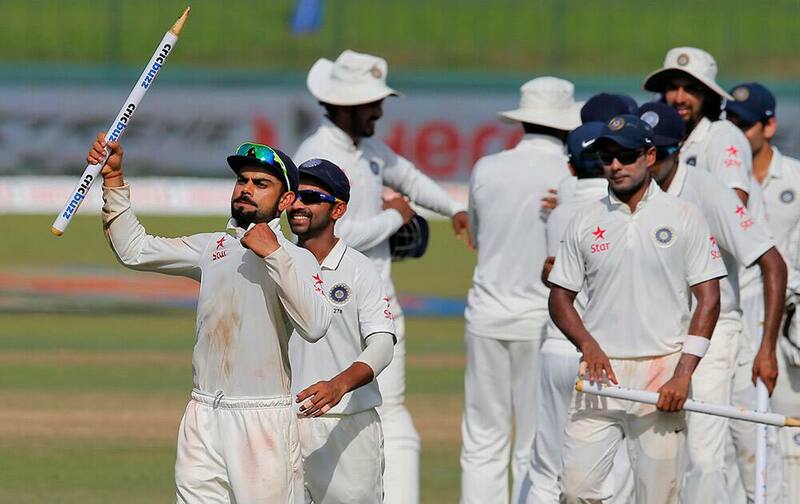 India won the third cricket test match by 117 runs and the series by 2-1. Virat Kohli holds a stump as he leads his team off the pitch after defeating Sri Lanka in their third test cricket match in Colombo, Sri Lanka. India won by 117 runs. 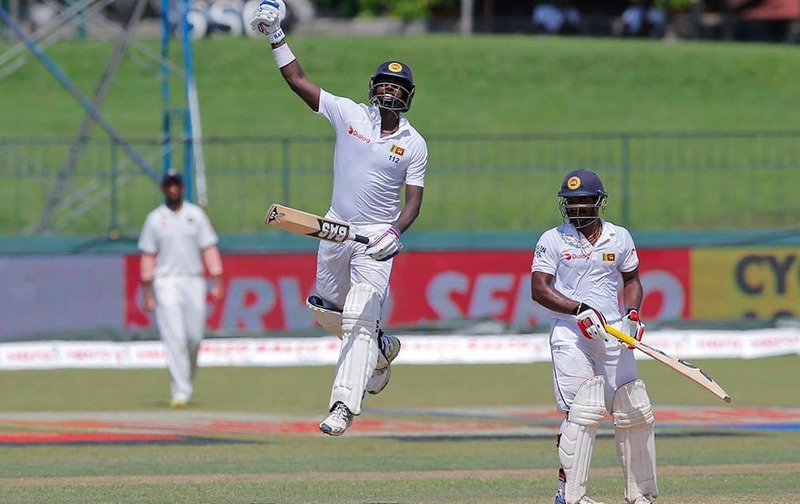 Angelo Mathews jumps as he celebrates scoring a hundred as non striker Kusal Janith Perera watches on the final day of their third test cricket match in Colombo, Sri Lanka. 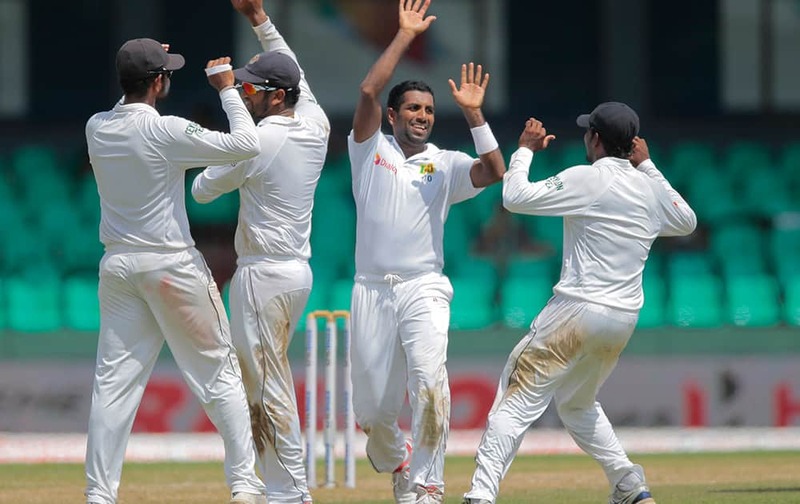 Ravichandran Ashwin face to camera celebrates the wicket of Sri Lanka's Lahiru Thirimanne with team mates on the final day of their third test cricket match in Colombo, Sri Lanka. 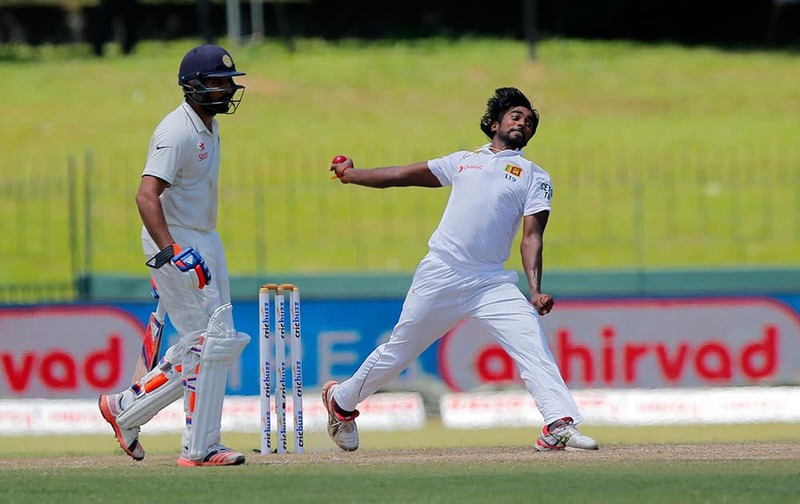 A bouncer bowled by India's Ishant Sharma hits Sri Lankan batsman Lahiru Thirimanne on his helmet on the final day of their third test cricket match in Colombo, Sri Lanka. 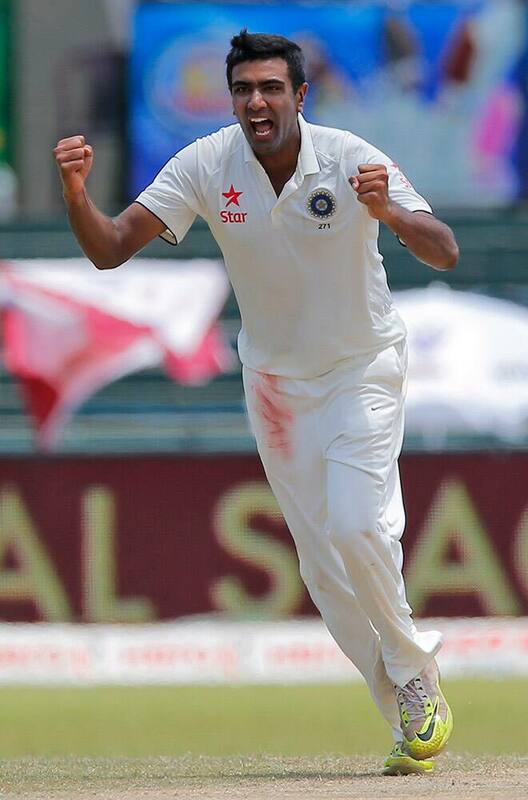 Ravichandran Ashwin celebrates the wicket of Sri Lanka's Lahiru Thirimanne on the final of their third test cricket match in Colombo, Sri Lanka. 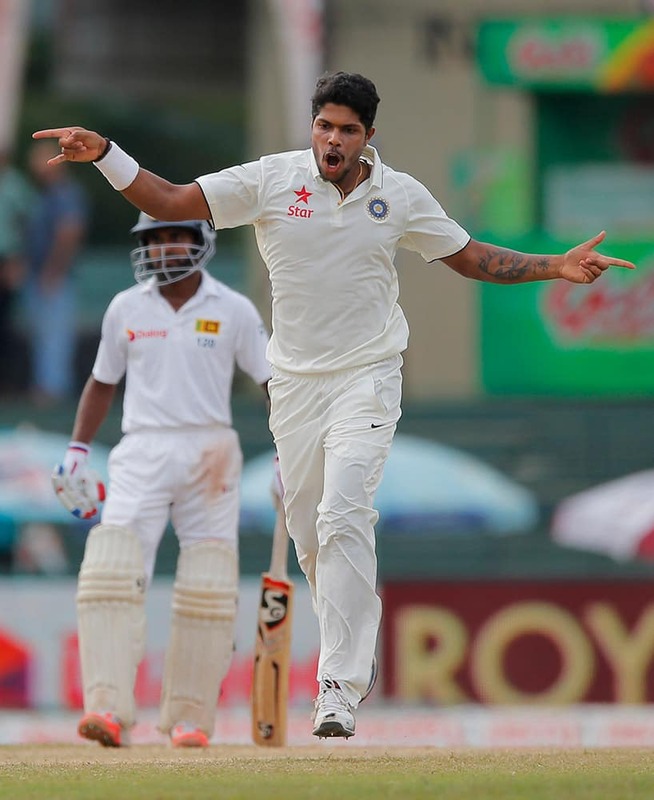 Umesh Yadav celebrates taking the wicket of Sri Lanka's Dimuth Karunarathne, unseen, on day four of the third test cricket match between them in Colombo, Sri Lanka. 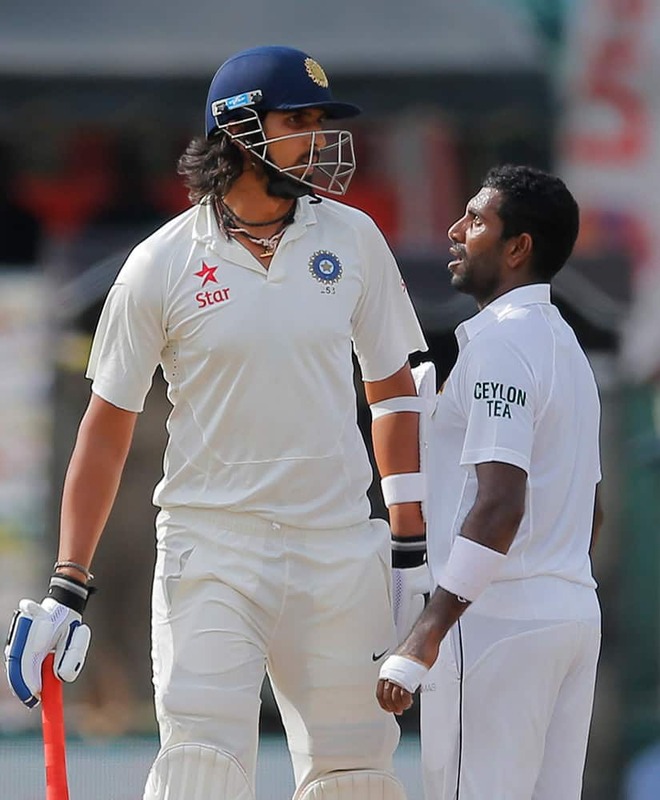 ri Lankan bowler Dhammika Prasad, right and India's Ishant Sharma exchange words on day four of the third test cricket match between them in Colombo, Sri Lanka. 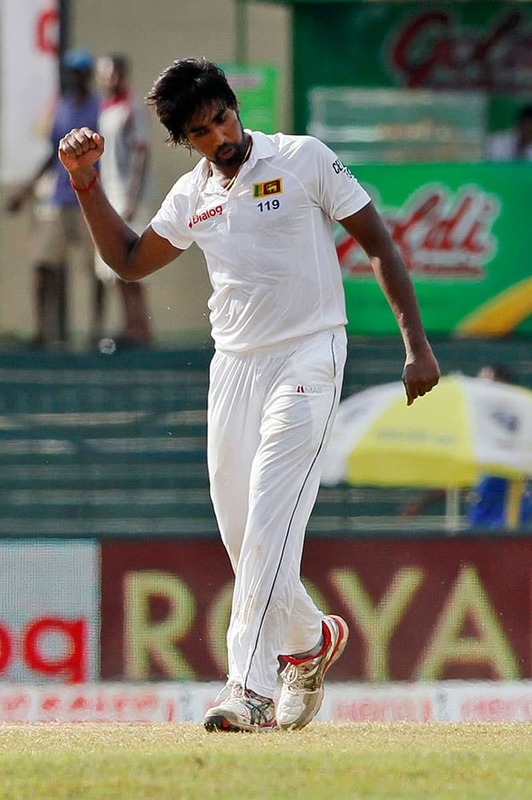 Sri Lankan bowler Dhammika Prasad, back to camera and India's Ishant Sharma exchange words on day four of the third test cricket match between them in Colombo, Sri Lanka. 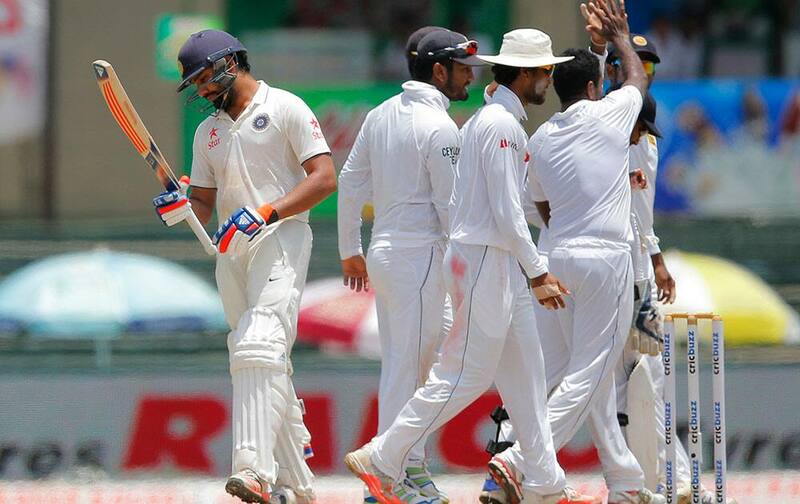 India's Rohit Sharma, left, leaves after being dismissed as Sri lankan players celebrate on the day four of their third test cricket mat in Colombo, Sri Lanka. 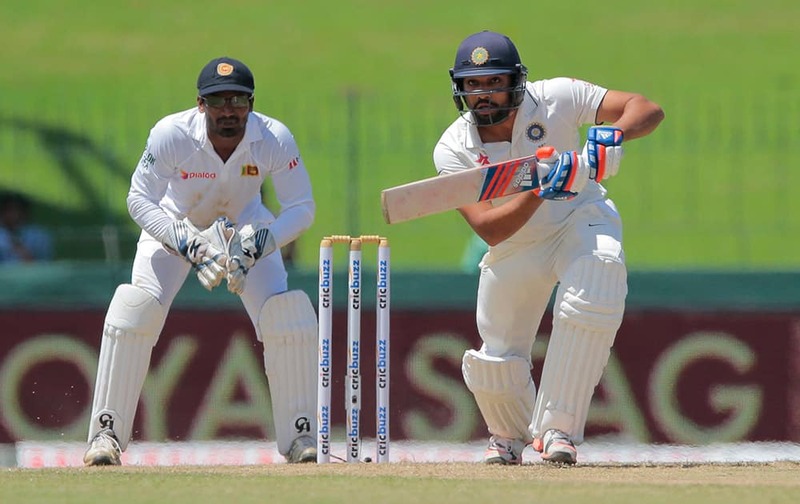 Sri Lanka's Nuwan Pradeep bowls a ball as India's Rohit Sharma, left, watches on day four of the third cricket test match in Colombo, Sri Lanka. 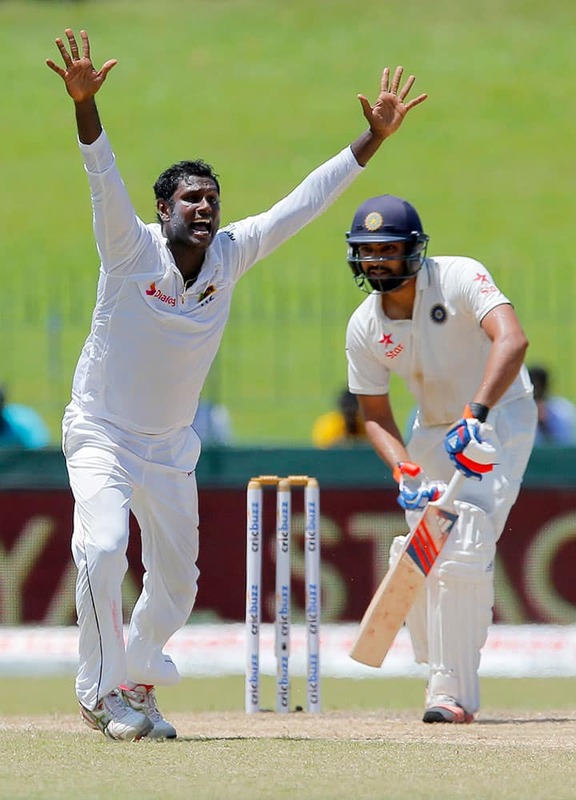 Sri Lanka's Angelo Mathews, left, unsuccessfully appeals to dismiss India's Rohit Sharma on the day four of the third cricket test match in Colombo, Sri Lanka. 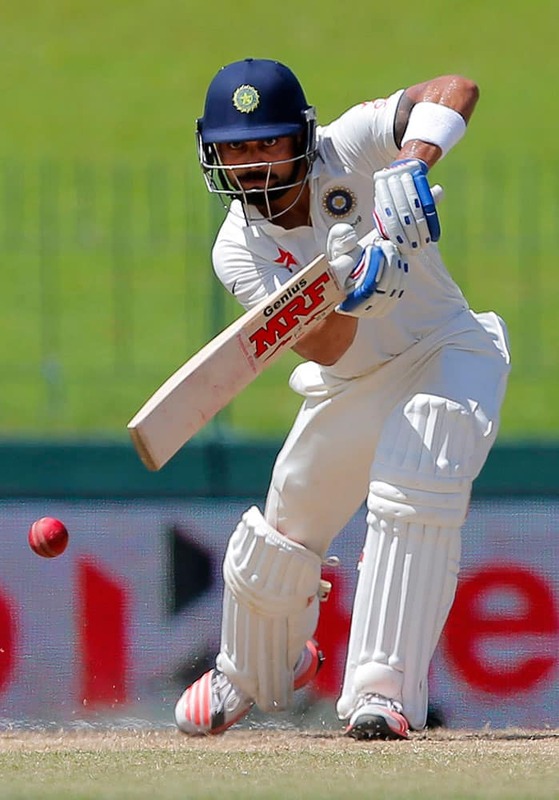 India's Virat Kohli plays a shot on day four of the third cricket test match against Sri Lanka in Colombo, Sri Lanka. 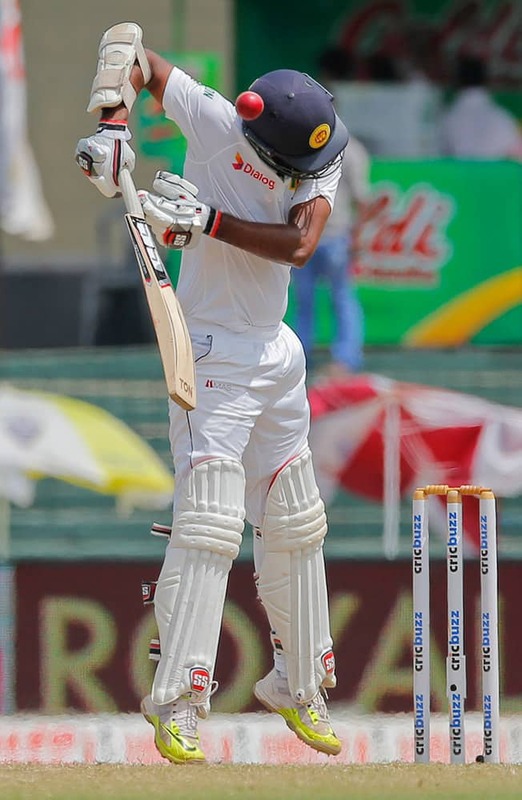 Sri Lanka's Nuwan Pradeep celebrates the dismissal of India's Lokesh Rahul on the third day of their third test cricket match between them in Colombo, Sri Lanka. 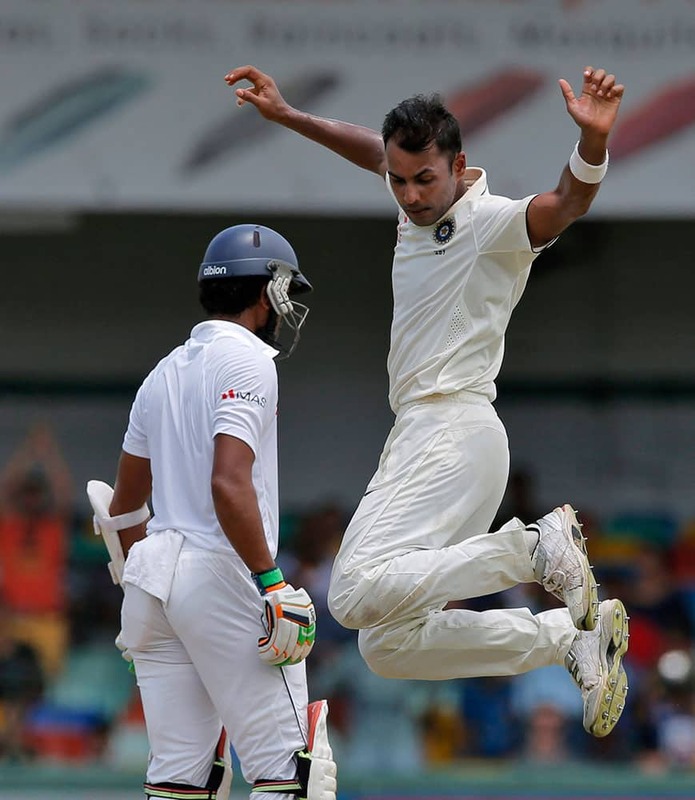 India's Lokesh Rahul is bowled out off a delivery by Sri Lanka's Nuwan Pradeep on the third day of their third test cricket match between them in Colombo, Sri Lanka. Sri Lanka's Dhammika Prasad, second left, celebrates with teammates the dismissal of India's Cheteshwar Pujara on the third day of their third test cricket match between them in Colombo, Sri Lanka. 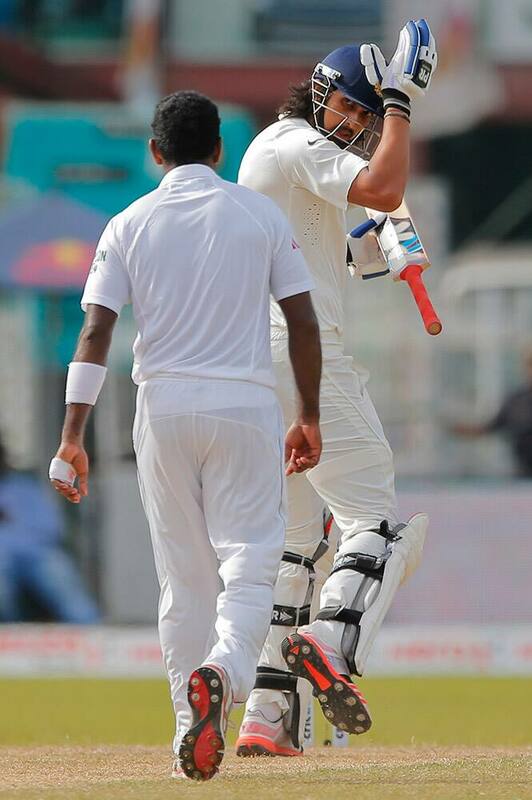 India's Stuart Binny, right, celebrates the dismissal of Sri Lanka's Dinesh Chandimal on the third day of their third test cricket match between them in Colombo, Sri Lanka. 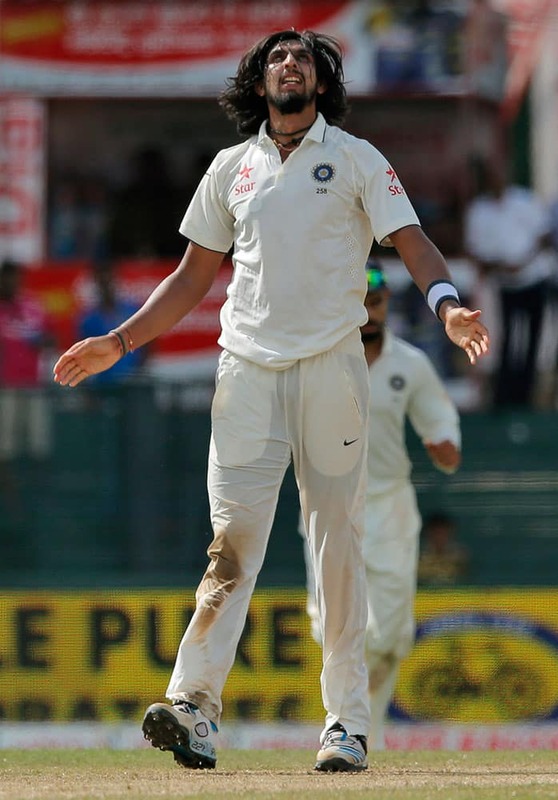 India's Ishant Sharma celebrates taking the wicket of Sri Lanka's Rangana Herath on the third day of their third test cricket match between them in Colombo, Sri Lanka. 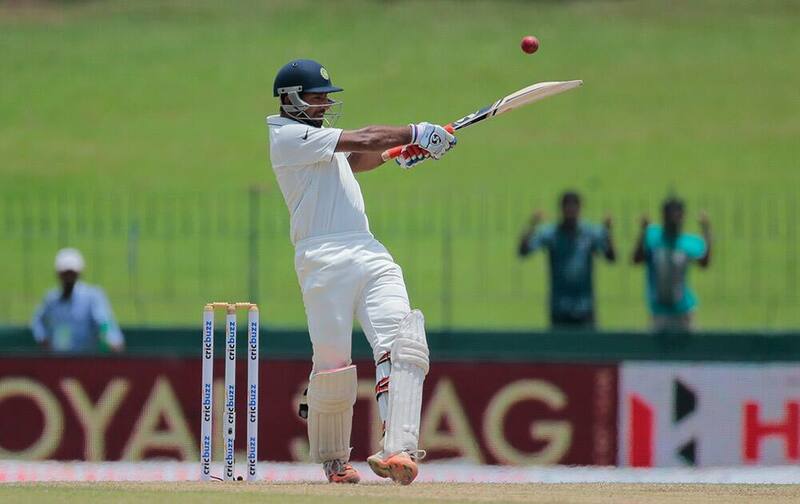 Amit Mishra, bats on the second day of their third test cricket match against Sri Lanka in Colombo. 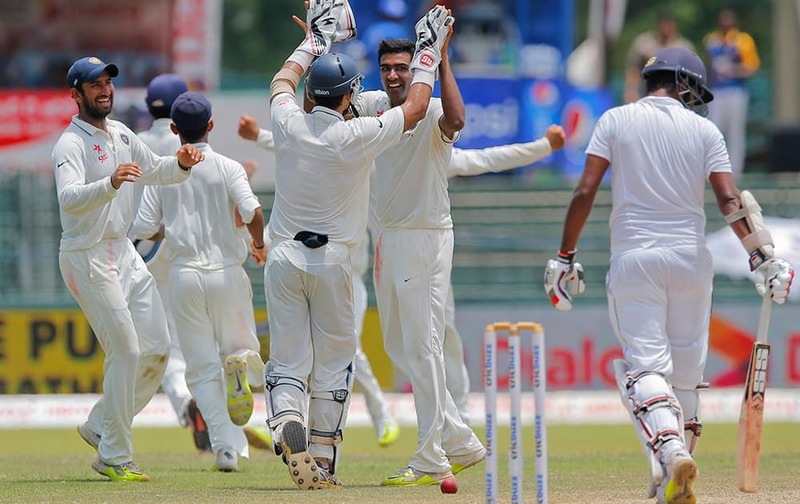 Dhammika Prasad, second right, celebrates the dismissal of India's Ravichandran Ashwin on the second day of their third test cricket match in Colombo. 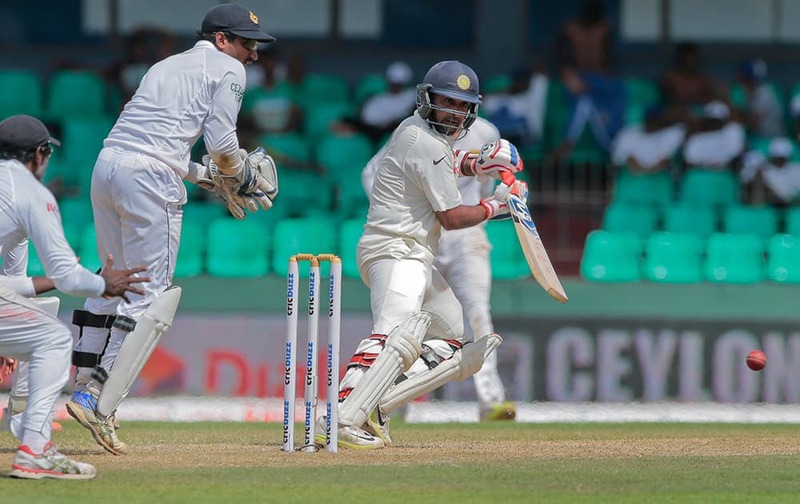 Rohit Sharma plays a shot as Sri Lankan wicket keeper Kusal Janith Perera watches on the second day of their third test cricket match in Colombo. 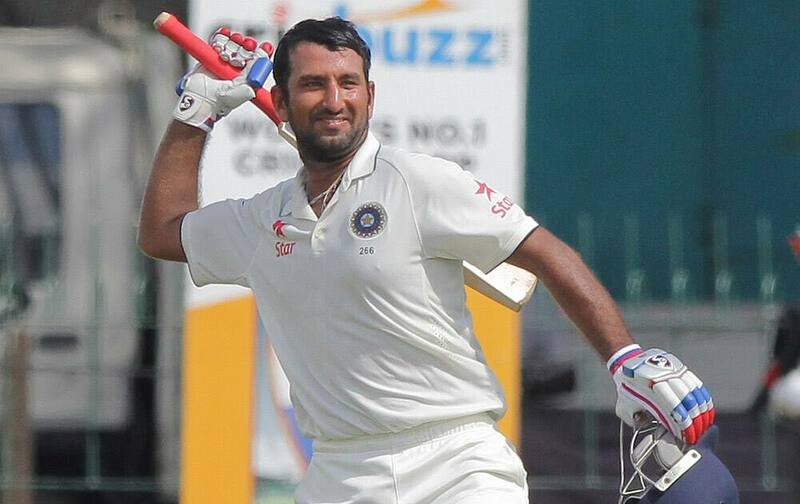 Cheteshwar Pujara, celebrates scoring hundred runs on the second day of their third test cricket match against Sri Lanka in Colombo. 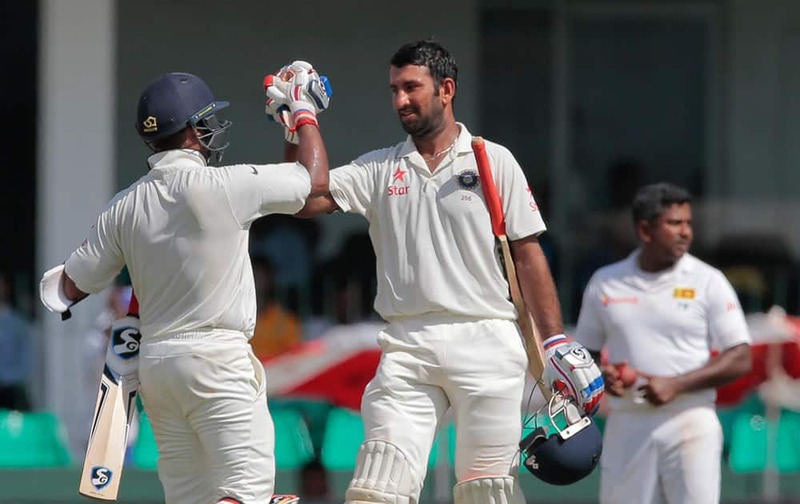 Cheteshwar Pujara, century celebrates scoring a hundred runs with teammate Amit Mishra, back to camera on the second day of their third test cricket match against Sri Lanka in Colombo. 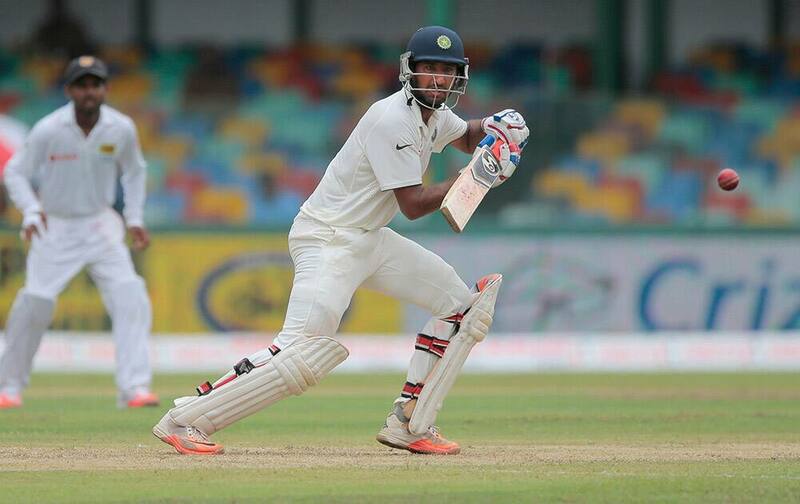 Cheteshwar Pujara, bats on the second day of their third test cricket match against Sri Lanka in Colombo, Sri Lanka. 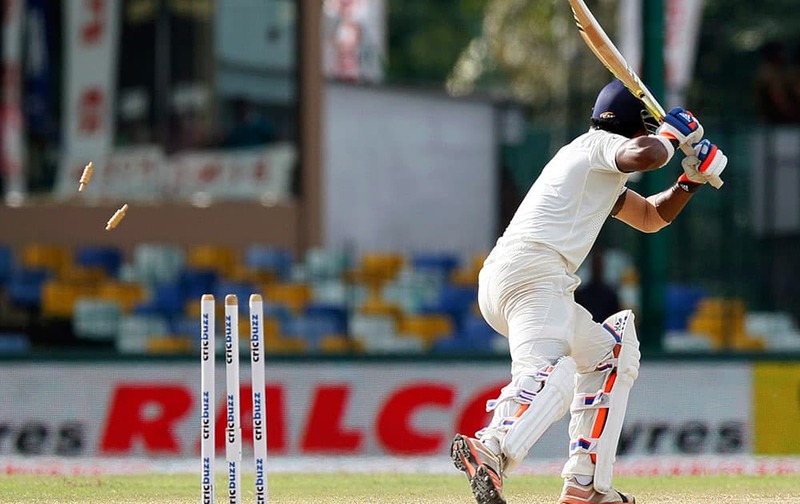 Cheteswar Pujara plays a shot as Sri Lankan wicket keeper Kusal Janith Perera watches on the second day of their third test cricket match in Colombo. 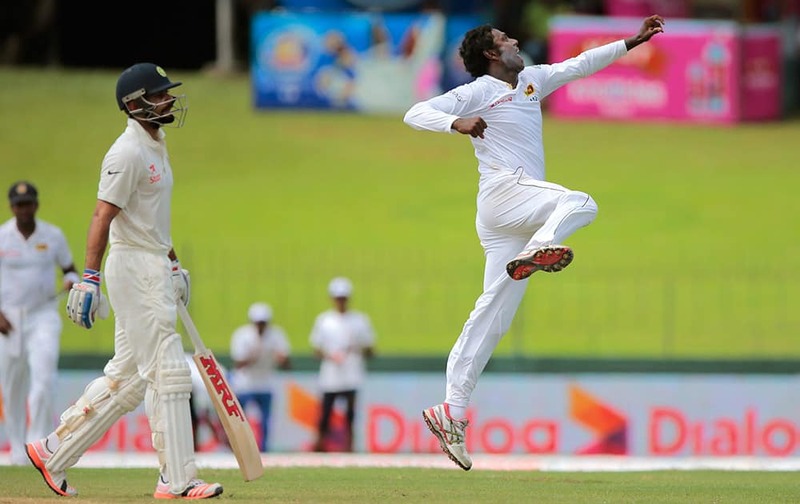 Sri Lanka's Angelo Mathews, right, celebrates the dismissal of India's Virat Kohli, left, on the day two of their second test cricket match in Colombo. 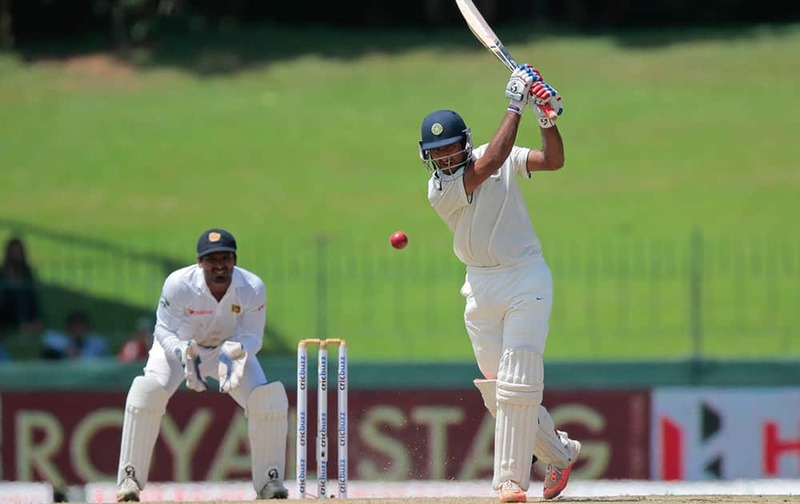 Cheteshwar Pujara plays a shot against Sri Lanka on the day one of their third test cricket match in Colombo, Sri Lanka. 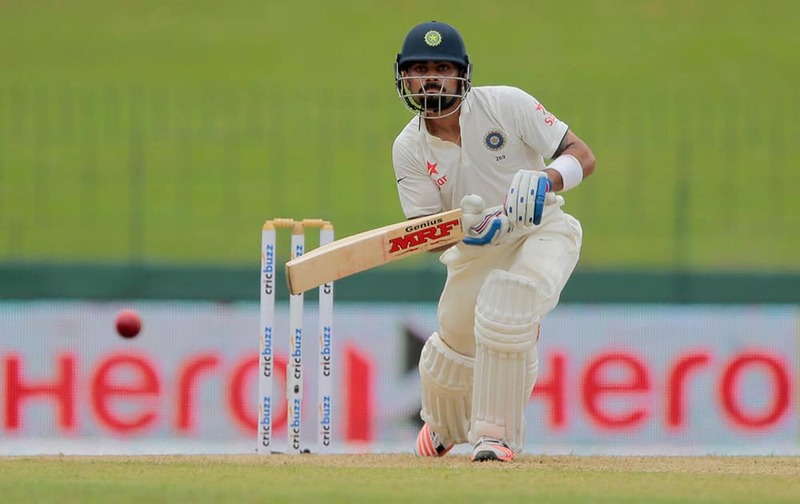 Virat Kohli plays a shot against Sri Lanka on the day one of their third test cricket match in Colombo, Sri Lanka. 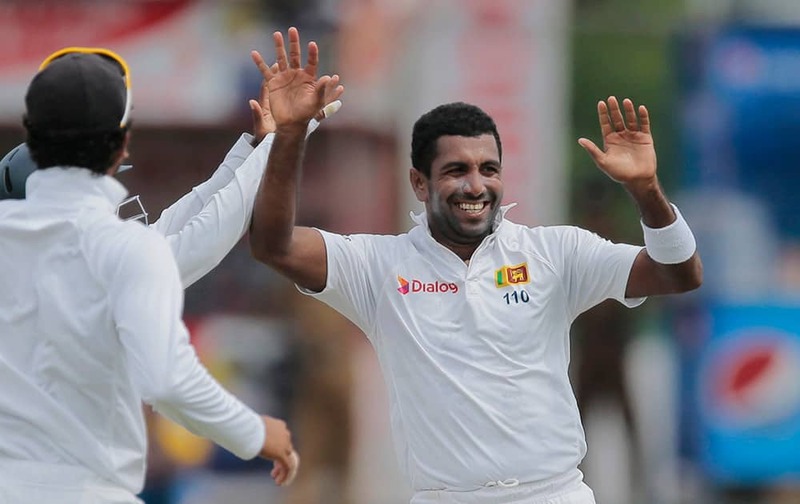 Sri Lanka's Dhammika Prasad celebrates the dismissal of India's Lokesh Rahul with his team mates on the day one of the third test cricket match in Colombo, Sri Lanka.